Daniel W “Danny” Litwhiler was born in Ringtown, Pennsylvania on August 31, 1916. Before baseball, Litwhiler earned a bachelor's degree in Science and Social Sciences in 1938 from Bloomsburg State Teacher's College (now Bloomsburg University) in Pennsylvania. That summer he signed with the Detroit Tigers and batted .369 at their Alexandria farm club. During the spring of 1939, Litwhiler, now a top Tigers’ prospect, was with Toledo of the American Association at their Harlingen, Texas, training camp. During a training session the young outfielder put his foot in a hidden hole and twisted his knee, severely tearing cartilages. Litwhiler was on crutches when Toledo handed him his release because they did not think the knee would ever heal properly. Litwhiler returned to Bloomsburg College where he took a job coaching baseball, football and basketball. He had given up on the hope of playing professional baseball again and almost a year had gone by when he received a letter from the Philadelphia Phillies. Gerry Nugent, the Phillies’ president offered to pay for an operation on Litwhiler’s knee and if he recovered fully he would come to spring training in 1940. Litwhiler made a great recovery and opened the 1940 season with the Phillies. He got off to a slow start at the major league level and was assigned to Baltimore, but after playing just 10 games there he was sent to Wilkes-Barre where he batted .305 in 103 games. The Phillies recalled him in August and had a 21-game hitting streak, finishing the major league season with a .345 batting average in 36 games. In 1941 he became the Phillies' regular left fielder and batted .305 with 18 home runs and 66 RBIs. Litwhiler’s knee problems kept him out of the service for most of the war, but he was part of a USO sponsored trip to Alaska and the Aleutians during the winter of 1943-44. "I was 4-F because of my knee," Litwhiler recalled, "and I figured I could do something for the service people if I went on the trip. We were up there about three weeks. It was a tough trip, but it was worthwhile. We would show our World Series film and answer questions at the different bases, and they liked it. Afterward, National League President Ford Frick, asked for our suggestions. I suggested that the troops would like to hear a 'Game of the Day,' which the military could pick up on shortwave. Frick thanked me, and they started broadcasting a major league game every day." After being turned down for military service seven times, Litwhiler was finally accepted for 'limited service' in early 1945. Litwhiler was stationed at New Cumberland Reception Center, Pennsylvania, where he quickly organized a baseball team. He was then assigned to the Army’s Ninth Service Command at Fort Lewis, Washington. The battalion commander, learning of Litwhiler's baseball experience, asked him to start a recreation program. Litwhiler organized softball teams by platoons. The games were so popular that he was named recreation director for the 10,000 servicemen at Fort Lewis. He and his assistants established teams for softball and touch football. They put in ping-pong tables and pool tables, they organized card games, and they auditioned GIs for entertainment shows. "We also had a baseball team," Litwhiler said, "and we won the Ninth Service Command Championship. I coached the basketball team and we won that championship too." In fact the Fort Lewis Warriors were one of the strongest service teams in the region. The line up included Red Embree, Bill Fleming and Dom Dallesandro. In 1945 they won 30 consecutive games. 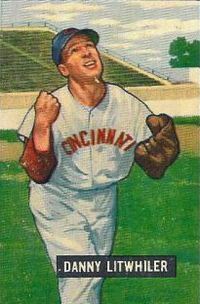 Litwhiler left military service in May 1946, and continued to play in the majors with the St Louis Cardinals, Boston Braves and Cincinnati Reds until 1951. He also coached with the Reds in 1951. Litwhiler was in the minor leagues as a player-coach from 1952 to 1954. In 1955 he became coach of the Florida State University baseball team and held that position until 1963, leading the team to three College World Series. In 1964, Litwhiler took over as head baseball coach at Michigan State University, leading the Spartans to Big Ten Championship titles in 1971 and 1979. Litwhiler has been inducted into the Hall of Fame for the state of Pennsylvania, Bloomsburg University, Florida State University, the American Baseball Coaches Association, the Helms Athletic Foundation and Michigan State University. Created May 26, 2007. Updated June 18, 2007.